This review discusses the various factors of a product called Fungi Nail Toe and Foot Ointment. 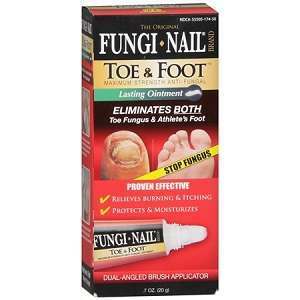 Fungi Nail Toe and Foot Ointment claims to eliminate all forms of fungal infections that can plague one’s feet. This product is specially designed to kill off all of the common types of fungus that can cause infections, such as athlete’s foot (tinea pedis), jock itch (tinea cruris), and ringworm (tinea corporis). It claims to treat the numerous, painful side effects that these ailments have, such as the burning sensation, itching, cracking of the skin, chafing and scaling on the feet. Continue reading if you are interested in finding out all there is to know about Fungi Nail Toe and Foot Ointment. The main active component found in Fungi Nail Toe and Foot Ointment is zinc undecylenate. This substance has been used to treat fungal infections for a very long time, and it is backed by extensive scientific research. The substance is a fatty acid that prevents fungus from growing. The addition of zinc helps treat the swelling, and other kinds of irritation caused by the fungus in question. Despite what the packaging might have you believe, this product is not intended to be used on either the scalp or on nails, as the active ingredient isn’t effective in these areas. Detailed instructions on how to use this particular product are freely available to assist any customers should they be at a loss as to how they should apply the cream. Fungi Nail Toe and Foot Ointment comes with a special brush that can help with applying the cream. One side has a wider angle to effectively treat the skin between the toes in the case of athlete’s foot treatment, while the other, a smaller tip is useful when applying the cream under the toenails. The surface area that you wish to treat with the cream must be cleaned and washed with care, and then completely dried. After this, the area must be covered by a not too thick layer of Fungi Nail Toe and Foot Ointment, and allowed to dry. Usually, you should apply the cream twice each day. It is best to use every morning and evening, for a period of 4 weeks. Due to some of the ingredients, it is possible that the usage of Fungi Nail Toe and Foot Ointment will result in skin irritation in some cases. However, this is rather rare. The cream must be kept away from the face and eyes, as well as from children. A 0.7 ounce tube of Fungi Nail Toe and Foot Ointment costs $8.99 with no additional shipping costs. There is also an offer for monthly subscriptions, which gives a 5% discount. There is no guarantee policy determined by the manufacturer, which is suspicious to say the least. Fungi Nail Toe and Foot Ointment is a decent product with an effective formula that is backed by extensive research. However, the price is significantly higher than other similar products, and with no guarantee in place, the high price becomes all the more troubling. Jimmy Rodriguez	reviewed Fungi Nail Toe and Foot Ointment	on June 10th	 and gave it a rating of 2.5.